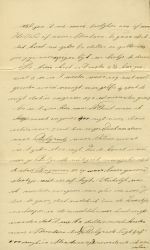 Letter from Johannes [John] Koning to the Hoogland family [I think]. 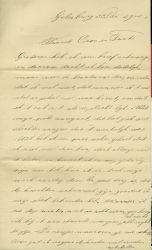 Galesburg [Illinois] Dec[ember] 3, 1900. Yesterday I received your letter, and that’s why I like to answer immediately; because I know, when I’ll postpone it, it won’t happen just like with you. About my wrist, it turned out better than it looked at first sight. Although I had a few weeks in which I couldn’t do much, but it soon recovered. While it is still painful, I can do my job properly. It is a good thing that servants are scarce, so I could keep my job. If I take care of myself this Winter I hope to be all right next Spring. The trips you wrote about uncle, I have to put off because of the costs. It looks good to me to go to Holland [Michigan] or to go to Montana, but it will take 60 dollars at least and that kind of trips actually are to expensive for me. From here to St. Paul [MN], where I have to pass, it is about 900 miles [must be kilometers?] whereto I can go maybe for 3 cents. But from that point to Belgrade, where Klaas lives, it is at least 1600 miles [kilometers?]. Take a look at the map and when you don’t see Belgrade on it, the city of Bozeman will be on the map for sure, where the first mentioned village is not far away from it. Last Spring I really meant to go to Kl[aas], but after I heard from the ticket-seller in the waiting-room that it would cost me 60 dollars to Montana (Belgrade is situated 4 or 500 miles in Montana) I changed my plans. Klaas traveled with an emigrant-train. Those trains are cheaper and also different, not only from New York on. 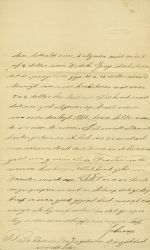 According to the letters of mother and sisters, uncle W. should return next Fall and going to live in Old Country upon the interest [of his money], but I don’t think uncle will ever achieve that. I spoke to a Hollander here who also had relatives there; he told me that reverend Gruis, I believe that was his name, the founder of the Dutch settlement there, had lured his countrymen to that place most for his own benefit. This reverend has most of the irrigation works in his hands where he makes a lot of money with. He told me there were a lot of people who wanted to go back whenever they were able to do so. However I hope for Klaas my information is wrong. The farm here is generally doing well and growth/crops like grain and corn are worth a good price. Here there are mostly sheep-farms because of the wool. One pays generally about 3 or 4 dollars per head. Young bull-calves, which means just born, cost 11 till 15 dollars while one cannot ask over 3 or 4 dollars for a cow-calf. Which is caused by the fact that people in general apply upon fatten of steers. Many farmers feed over 100 steers. Everything happens outside and first I was surprised that the cattle grows as well in the cold as they do in ‘Friesland’ in the warm stables. The reason is that it is another kind of cattle. 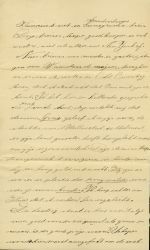 Well uncle and aunt, my paper is filled and I hope that you may receive this letter in the same state of health as it leaves me and that you’ll write soon to your nephew Johannes. Postscript The little child of A. and J. deceased. J. is ill but will recover. * Because the eastern part of the USA had a much greater population density, it was cheaper to ride the railroad than in the western USA with a much lower population density.